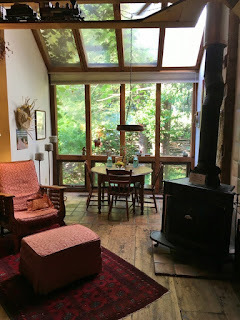 "" Writer's Wanderings: Celebrating 48 Years! This year was our forty-eighth wedding anniversary. Many times we have been on the road or out at sea celebrating but this year we were between trips. 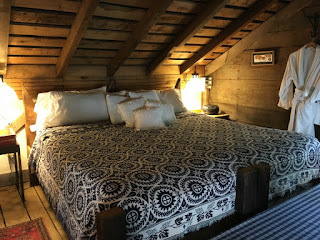 My wonderful and clever husband decided to surprise me with an overnight stay at one of the nice bed and breakfasts in our area. 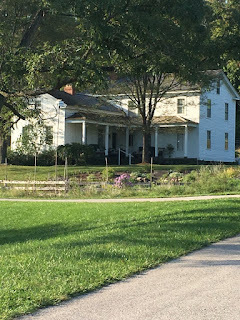 The Inn at Brandywine Falls is actually on Cuyahoga Valley National Park land and is a top rated B&B. The neat thing too was that about 25 years ago when they were first getting started and I was still writing for a small local newspaper, I got to interview the couple who own and operate it. I was excited to see how things were going. Katie and George Hoy are still the quintessential hosts. The house was built in 1848 and has been renovated but kept true to its original design. An out building has also been restored and made into two suites called The Granary. We stayed in one of them for our anniversary night. The Loft, as our suite was called was very rustic and certainly country with all of the chicken themed accessories. There were two futons in the sitting area, a table in the area that was glassed in and resembled a wall of a greenhouse that looked out into a shaded area of the yard. On the table was a bowl of fresh fruit, two homemade cookies and best of all, two homemade chocolate buckeyes. If you are a buckeye, especially an OSU buckeye, you know the delight of the peanut butter/chocolate treat. 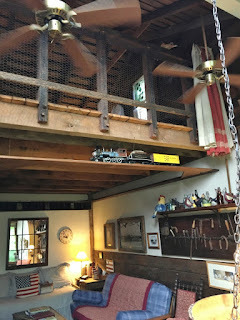 One other unique feature was the train that ran on a track above our heads. You could turn it on with a light switch by the door. We left it off. I was afraid it would make me dizzy. 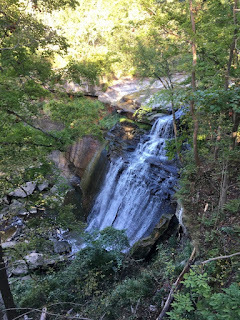 We went for a walk to the falls which were about five minutes up the bike trail from the Inn. A photography class was all set up at the lower viewing area taking pictures. 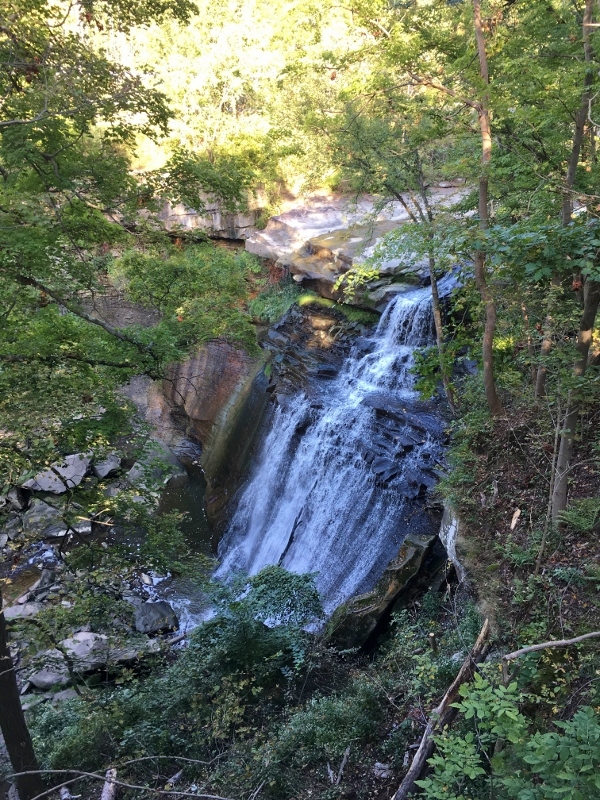 The falls spread out almost like a bridal veil train. After all the waterfalls we saw in Iceland it was still special to view this one. Back around the Inn we enjoyed watching the variety of chickens and a couple of goats that reside in the yard of the Inn before heading out to dinner at a local restaurant. It was a quiet evening when we returned. While our evening was nice, the best part of our stay was breakfast. The Hoys and their staff put on quite a spread. There was cinnamon/apple oatmeal with toppings and fresh fruit, orange juice in a fancy stemmed glass, a sausage meatloaf with herb-seasoned scrambled eggs and George's fresh baked oatmeal bread. Add to all that a great cup of coffee with bottomless refills and you have some of what made this breakfast great. George joined us while Katie served up the hot meal. She then joined us as well and the stories began to flow. There were historical notes about the area and tales of adventures of being a B&B host and the guests (there were ten of us around the table) joined in with their own stories. An hour and a half later we all decided we'd better get on our way or we'd be there for lunch. It was back to reality for us--the grocery store and home just a half hour away. Such fun and an anniversary to remember and we didn't even have to drive far to enjoy it.